At the moment I spend most of my time working for Enders Analysis, a boutique TMT research and consulting shop. 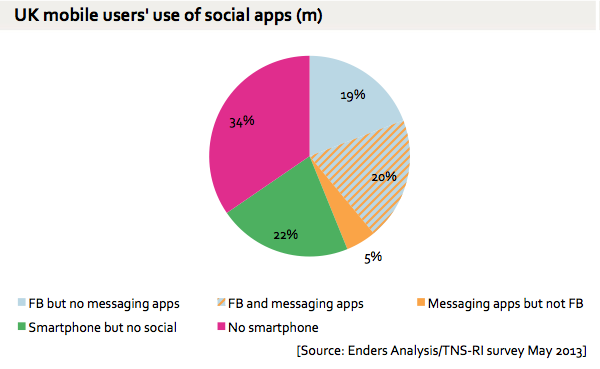 Every year Enders does a big UK mobile user survey, and this year I stuck in some questions about use of Facebook and of mobile messaging apps (Whatsapp et al). On Friday I put out a note to Enders clients with the conclusions, but this chart is worth publishing as a teaser. The universe is UK adult mobile users. Of these, about 66% now have a smartphone, and 39% are using Facebook on mobile. But, a majority of those users are also using one or other of the various mobile messaging apps - Whatsapp, Kik, Viber and so on - and overall a quarter of the UK adult mobile base is using them. If you look just at 16-24s, the data gets even more interesting: 70% report they're using Facebook and 57% are using other messaging apps. Again, there's massive overlap: people have Facebook but chose to use other things instead.